Losing all this weight is a nice side benefit from training so much. But one downside is now all my pants don’t fit me! I dropped one more inch off my waist so I went over to Gap and bought a boatload of new pants from them. I can only hope that I maintain this waist size throughout the year. I think during the off season I may go back an inch, so I won’t throw away my previous pants. But it is time to clean out my closet so many clothes need to leave and now it’s more easier motivation to get rid of all these pants that don’t fit no matter what! It should be interesting to see if I’ve reached a new setpoint for my body in terms of its weight and overall size. 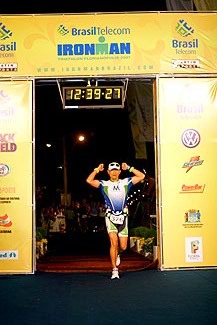 This entry was posted in Ironman Brazil 2007 on June 4, 2007 by dshen. This year my recovery from Ironman is moving at a rapid pace. 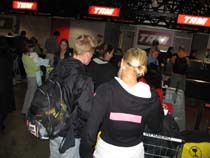 At my first Ironman (NZ), it took me 6 weeks to fully recover. 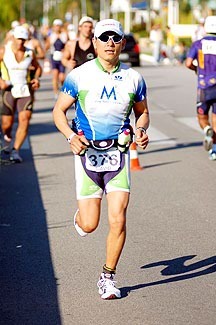 Last year at IM Austria, it took me 4 weeks. And this time, I think it will be less than 4 weeks. On Friday, I went for a swim and only did 1600m, but I was able to swim with no aerobic problems. Only when I tried to do a fast set that I felt my body jump to LT only after the 3rd 50m of a 6×50 fast set. It was then I just decided to get out of the pool. Yesterday the same thing happened on the bike. I went out for an hour ride on Foothill Expressway which is flat, gentle rolling terrain. While on that flat terrain, I didn’t feel any discomfort at all. Maybe my HR was a tiny bit higher than normal, but I felt pretty good. It was only when I tried to accelerate up a small hill when I jumped straight to LT and I felt like I was exerting much more than normal. I want to change my recovery from previous years where I went international and basically did nothing for a full week afterwards. I recovered, but the inactivity made it really hard to get back into the activity after such a long layoff. So now I want to try keeping sessions short, but testing where the boundary is between my effort level and when I hit LT. I won’t push it too hard, but I want to keep my body stimulated so that it doesn’t fall into that area where I can’t really pick it up easiliy. I’ve got a longer season this year with IM WA at the end of the year and need to keep focus for many months after now. In previous years, it’s been really tough to rally after my single Ironman and I need to change that. 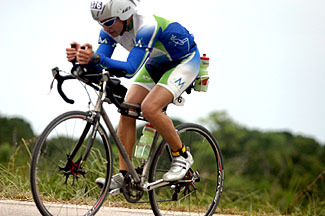 This entry was posted in Injury Prevention, Recovery, Healing, and Performance Enhancement, Ironman Brazil 2007 on June 3, 2007 by dshen. I just weighed myself this morning (Sunday after Ironman Brazil, one week later) and I’m a whopping 145 lbs.! At NYC Marathon last year, I weighed in at 147 lbs. And now with all this training, I’ve dropped another 2 lbs. at race time. Amazing! At least I don’t have to drag another 2 lbs with me while I run or bike. I wonder how much lower I will drop. It’s not like I’m trying to lose weight. It’s just happening naturally with all the training volume I’m experiencing. 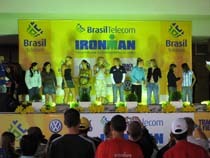 This entry was posted in Ironman Brazil 2007 on June 3, 2007 by dshen. Or is that a poplitius in your pocket or are you just happy to see me? I went to my Graston physical therapist on Friday and I told her about some pain I was having in the back of my knee. She starts touching the area behind there and I yelp in pain as she applies from massage techniques on my poplitius, this tiny muscle that runs behind my knee. She remarks that it is totally inflamed and very huge, certainly tender to deep tissue massage. Apparently it’s a problem common to cyclists. I’ve been dropping the heel to engage my hamstrings and glutes during the downstroke of biking. 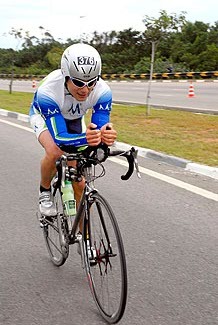 I was focusing on this during Ironman Brazil and it got painful towards the second half of the bike. But now I’m thinking that I shouldn’t drop it so much, or otherwise, my poplitius may get overstretched and strained, like in my case now. Ice and rest is the remedy for the short term. 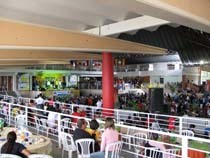 IM Brazil: More Official Pics! 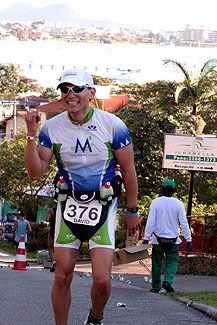 This entry was posted in Ironman Brazil 2007 on June 2, 2007 by dshen. Here are the official pictures I bought of me racing. 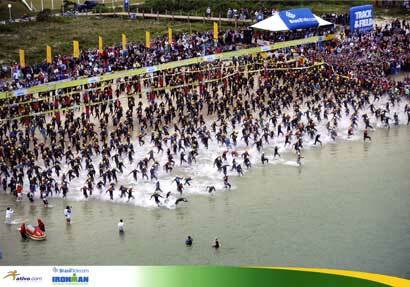 Look at that mass of swimmers at the start! 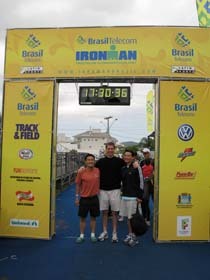 This entry was posted in Ironman Brazil 2007 on June 1, 2007 by dshen. I have found that international Ironmans often don’t end after the race. 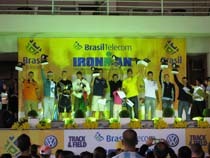 Sometimes, it is an Ironman quality effort to get home afterwards, and Brazil was no exception. I think the whole country’s national pasttime is waiting in lines. Unfortunately, it means that all your 21st century sensibilities on how much time you need to do something are thrown off completely. I get up on Tuesday morning and see Keish and Scott off. They are on an earlier flight out of Floripa to Sao Paolo and will catch different flights back to their homes. 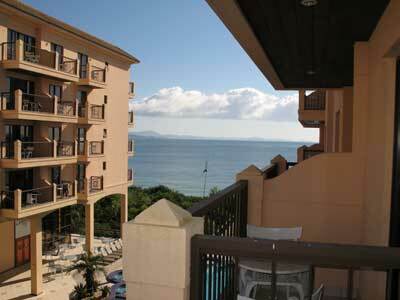 I take a nap and bum around the hotel all afternoon until my shuttle at 6pm to Floripa airport. My flight is at 810p; I tried to get on the earlier flight out but could not. Apparently another flight was cancelled and everyone was piled onto the afternoon flight and my flight. Thus began my troubles in getting back to SF. We boarded the 6pm bus to Floripa airport. Somehow planning doesn’t work too well in Brazil at all. It starts with the fact that a whole bunch of Ironman athletes are traveling with our bikes and have extra big bike boxes. They find another van and load it to the brim with bike boxes and suitcases. Then, we’re off and hit traffic. When we slowed to a crawl, I knew we were in trouble. Back at the EST desk, they insist that there is enough time to get on the plane if we leave at 6pm. I should have known better. First we hit traffic which just made us late to the airport. We had about an hour to get our luggage and ourselves checked in and knowing TAM counter lines, this would be impossible. As we pull up to the lines, we see they are long and see how slow they are moving. They have an assigned line for our flight but only one person working the counter, and that person is moving in slow motion and the line isn’t moving at all. As the time nears for the plane to depart, they assign 2 more people to help us get moving. But hey guys, it’s a bit late to be trying to move the line a little faster. So what do they do? They basically hold the plane up until the line for the flight has emptied out at the counter. What a system. They also knew we weren’t going to make our Sao Paolo connection to Miami that night, so they booked us on another flight the next morning and we’re sunk, knowing we’ll have to spend the night in Sao Paolo. The damn line caused us to leave an hour later than normal and we get into Sao Paolo just as the plane for Miami was leaving. A TAM person who barely spoke english held us all there and directed us to go upstairs to the check-in counter and get our hotel vouchers. Another guy had actually gotten to the airport early just so he could get through the check-in line and get on the plane faster still could not make that connection to Miami. It’s close to 11pm now and there are about 10 of us all trying to get to Miami, and we all walk upstairs to get our vouchers. While we’re up there, we complain and they help us book new flights in the US as we’ve missed all those connections as well. This takes forever. It seems that the computer systems barely work at all. We sit there at the counter and wait. I call Abby at EST and try to get her help. Good thing my mobile works there so she suggests emailing their travel service in Rio to help out. I tell her we’ll try if/when we get an internet connection. But waiting wasn’t so bad in some respects. We are there with Hillary Biscay and Nina Kraft and I introduced myself to both of them and chatted with them while we sat there waiting for them to finish up. This is the cool thing about Ironman; so many of the pros are such great people and they are very easy going and will talk to you. We chat about where we live, how the race went, etc. I also find out more about how they train and race, and their training and recovery strategies. I find the more experienced, fast Ironman athletes I talk to, the more I learn about the different ways people approach racing Ironman and how to get fast. Somehow, they manage to find our luggage. They sent someone down and pulled our bike boxes and suitcases and brought them up to us so that we had to take them with us to the hotel they provided with vouchers. A few people who were ending up in Miami got their details straightened out and left for the hotel. Soon it was me, Glen from Alabama, and Hillary Biscay just sitting there waiting for them to deal with our US connections and get us on new flights home. Crud, we’ve lost a day and both Glen and Hillary need to stay an EXTRA night in Miami before they get home. What a pain. It’s about 1am by the time we get out of there and we go down to find some taxis to go to the Monaco Hotel. We get into two taxis and they proceed to drive us down some really seedy looking streets of Sao Paolo. We are twisting and turning and pretty soon I have no idea where we are, except that outside it looks kind of slummy. I ride with Hillary and we look at each other and wonder if this taxi guy is going drive us somewhere and rob us. But, I see signs to the Hotel Monaco and am relieved that it seems like we’re on the right path, even if the neighborhood looks like a ghetto. The hotel itself isn’t bad. We check-in and get settled in. We sign up for a shuttle and the guy tells us that we could leave at 9am to make our 1030a flight no problem. I look at Glen and Hillary and say no f**ken way I believe this guy. I am discovering that Brazilians have the worst time sense ever. We book a shuttle for 7am instead and we pray it’s enough time. Glen and I go to the cafeteria and eat as all this standing around makes us hungry. So far, it seems as though we’ve just been hiking around and standing in line for hours upon hours. I think that next time I come race Ironman Brazil, I will introduce the quadruple brick workout: swim, bike, run, stand. All of us who raced have somewhat stiff legs and standing around isn’t allowing them to recover very much at all. At least the food is good. We eat a bit and then we hit the sack. By now it’s 2am and I set a wakeup call at 530a. How nice. 3 hours of sleep and ready to roll! The morning comes all too soon. I get up and shower and go down to eat. After eating, I go up and repack my luggage and come down and check out. The shuttle for us comes at 7am and this mini-bus can barely even take our luggage. They find another smaller van which load up to the brim with bike boxes and suitcases. But that is not even enough. 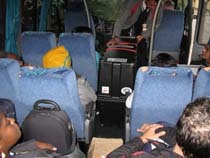 We slide 3 more bike boxes down the aisle in the mini-bus between us just to get everything on board and on its way. 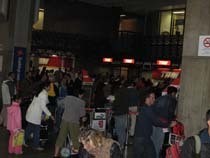 We all get back to Sao Paolo airport by about 730a and jump in line once again. What a pain. We all look at our watches and wonder if 3 hours is enough time to get checked-in and on board for a 1030a departure. Thankfully it is enough time as we get our stuff checked-in and manage to get through what passes for their security, with even time to spare for a bit of shopping. By this time, I am supposed to arrive SFO at 11am on Wednesday. Instead, I am arriving 12 hours later around midnite. For a while, I was worried that I might have to stay with Glen and Hillary in Miami for a night to catch the first flight to SFO in the morning. In fact, it almost was like that. 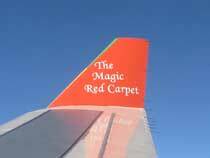 I get to Miami airport after a super long 8 hour flight of being wedged into coach class. I quickly drink some wine and try to sleep as I have barely slept at all. But we arrive and I kiss the ground and am ecstatic to be back in civilization in the US! We all make it down to baggage claim. I manage to grab my stuff first and say goodbye to my new found Ironman friends and move through customs. I rush upstairs and try to get checked-in ASAP. It is about 630p when I get to Miami and I have to leave at 815p! By 730p I finally make it to the counter and time is running out. I somehow jump into a shorter line which leads me through the explosive detecting puffer gizmo thing. At this point, I am running to the gate and find out that I’m on the oversold list. 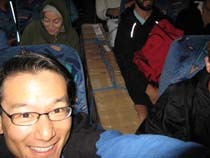 But then, a flight from Bogota that had a whole bunch of people who wanted to connect to SFO arrived too late, and I manage to grab a seat at that time. Whew! Getting on the plane to SFO was the biggest relief. I have not been in this type of situation in decades where connecting flights and airlines were so poorly managed. Maybe I’m spoiled by flying direct flights mostly where I go, but man it’s such a huge process to get to Floripa for this race, and yet another one getting back. It’s doubly worse when we don’t speak Portuguese either. It’s something to remember if I come back to do this race again someday, that my connections need more time between them and plus I have learned to not trust any Brazilian’s recommendation on shuttle times. Totally screwy time sense! I finally hit the tarmac at SFO at 1105p and could kiss the ground under my feet. I am ecstatic, finally knowing that I am home although I have lost a day. Tomorrow morning I have a 830a coffee meeting. Oh well. I live on little sleep anyways so what’s the big deal…? 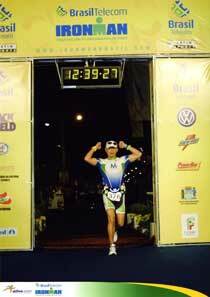 This entry was posted in Ironman Brazil 2007 on May 31, 2007 by dshen. 1. I’m still having trouble running off the bike for Ironman. I need to examine brick workouts and training for a fast Ironman shuffle in cases where my legs are not able to run with my normal stride and technique. 2. I need to continue building run strength, doing hill repeats galore. 3. Biking strength was decent for this race, but I want to continue building with Kings Mtn hill repeats, mixed in with Old La Honda repeats and sometimes doing fast, short, sprints up Mt. Eden. 4. Swimming I’m not so worried about and I will continue working on the continuous propulsion technique and extending my stamina. I think if it wasn’t for the strong current and the partial running on the beach, I would have come in about the same time as my other IM swims. 5. For IM WA coming up later this year, I may try to find some time to get more used to long rides in aero position, as supposedly it’s a very flat race. Well, they ALWAYS SAY it’s flat, but you never know until you get there. 6. Recover, recover, recover. Then rally for Ironman Half Vineman coming up late July. 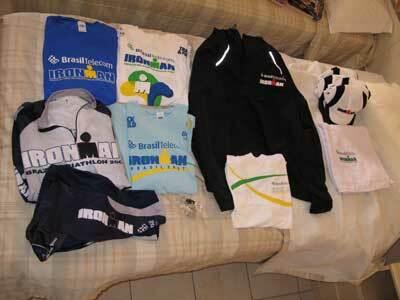 This entry was posted in Ironman Brazil 2007 on May 29, 2007 by dshen. Yet another sunny but chilly day in Florianopolis, in contrast to race day which was relatively cloudy and a bit drizzly at times. 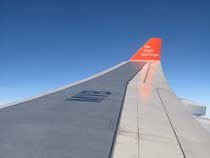 I don’t think I felt warm at any time here in Floripa at all despite the deceptiveness of the clear blue skies and sun. This morning I woke at 630a to go to the bathroom and as I turned on the doorway light, it explodes over my head, showering me with glass! I carefully backup as I’m in barefeet and put on my flip flops and my fleece and head downstairs to get someone to fix my light, because as the light blows, the electricity in my room also disappears. I fear that I may have blown the power in my whole section of the floor! Ironman races can become big shopping sprees. I try not to buy too much, but sometimes I do. I got 2 t-shirts for free, a participant shirt and a finisher’s shirt. Bought some hats to give to people and a nice windbreaker as well as other things. I am glad to wake up this morning with soreness in my legs quickly disappearing. The wiped out feeling in my chest and lungs is also disappearing fast and I think that my recovery after this Ironman could be as little as 2-3 weeks. I am happy to see that my tolerance for Ironman racing is growing year after year, as my recovery at IM NZ was 6 weeks and at IM Austria last year was 4 weeks. Somehow the “torture” year after year is becoming less tortuous as I race Ironman more often which hopefully means that someday I can race and just feel like it was another normal day the morning after. Tonite I head back to the airport for my long journey home. I got upgraded on my AA leg from MIA to SFO so very happy about that. Time to get my stuff together and then I’ll hang out in the hotel somewhere until dinner time at which time the shuttle takes me away. Onwards to Ironman Western Australia on December 3 later this year! Waking up the morning after Ironman is always a sore affair. You think you’re ok until you swing your legs off the bed and take a step. Ugh! But what can you do. At least this time, it’s a bit less sore than last time. That’s the good thing about doing multiple Ironmans; every time you race, you get a little more adapted to the stresses of Ironman until it doesn’t really feel like much at all anymore. That’s the goal. I hit breakfast and then head over to the special awards lunch. Great food again, some more chicken and pasta, and then watch the pros get their awards. Also, I pick up my race pictures and certificate. Definitely I am less sore than last year at Austria. I did not wipe out as bad as last year’s race, so I would expect to be a bit less sore this morning after. I took some 8 hour Tylenol and Emergen-C to ward off getting sick. In my chest, I do not feel as bad as last year. Most of the race I was very aerobic and did not reach threshold at all. I believe this is why I am not feeling it in my chest like I did the last 2 Ironmans. I hope it means I will recover faster this year. 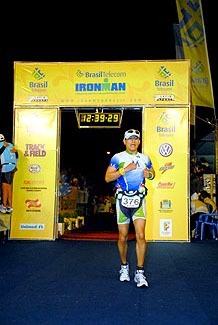 This entry was posted in Ironman Brazil 2007 on May 28, 2007 by dshen.